Background: Worldwide, lung cancer is the major cause of deaths due to cancer. Most of the lung cancer cases are categorized as 85% cases of non-small cell lung cancer, while remainder 15% cases are known as small cell lung cancer. The long survival time as well as the improved quality of life for patients undergoing lung cancer using conventional chemotherapy is still not satisfactory. Therefore, robust research undergoes development of drug delivery system which increased drug at target side with reduced systemic side effect. Method: Bibliography database reviewed various inhalable nanostructured drug delivery strategies for effective delivery of anticancer drugs to lung cancer which are designed to improve the therapeutic index of anticancer drugs throughout improvement of their stability as well as bioavailability. Results: It has been reported that nanostructure based inhalation chemotherapy is more successful targeting system and also offers reduced side effects than conventional chemotherapy. 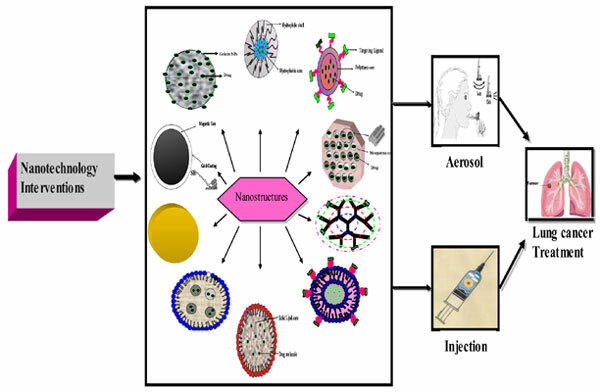 Conclusion: Thus, the review highlights the critical issues, strategies for delivery and provides detail on various inhalable nanostructures for anticancer drug delivery along with toxicity concerns as well as rationale behind development of inhalable nanostructures. Anticancer drugs, bioavailability, inhalable nanostructures, lung cancer, non-small lung cancer, small cell lung cancer.